With the rapid increase in the rate of crime throughout the world, it has become impossible to ignore the safety concerns of the citizens, specially the senior citizens. Although law enforcement agencies work hard to keep criminals at bay and make the citizens safe yet they cannot be present everywhere and every time. Hence, in times like these it is advisable to take safety in your own hands and keep your precious belongings as well as the lives of your loved ones secure. Nowadays there are many private manufacturers that offer different safety systems to make one safe when located in an unsafe neighborhood. With the modern technology being easily available, there is a plethora of options to choose for your safety whether it be a baton or any other self-defense weapons. But the most important belonging of a person’s life is overlooked, i.e. House that is at most risk of being attacked by robbers at night. Often in a rush to save money, people compromise on the quality and install cheap burglar alarm systems in their home that endangers the lives of those living inside. Hence, we are offering you the five types of alarms systems that one should have at home to keep the residents safe, especially the senior members of the family. Motion Sensors: The latest in burglar alarms systems technology till date that makes use of infrared light to detect any change in temperature on the property and easily track any unauthorized movement. These are perfect to be installed inside the property as well as outside to keep it completely protected at all times. Wireless Security System: No hassles with any extra wiring setup makes it a burglar alarm system worthy of being installed for total protection. This is the most convenient alarm system and can be easily installed anywhere on the property. Personalized Alarm systems: These are the easiest to carry around and can be easily triggered when there is a medical emergency or any other event that requires action. It is placed on the person’s neck or wrist and is a much needed alarm system for keeping the senior members of the family safe. Acoustic Alarm Systems: This gets triggered even on the drop of a hat so in case a burglar tries to act smart and try a break-in through the glass window then they are in for a long ride to prison. These are usually installed around windows or doors of the property to avoid unauthorized entry into the property. 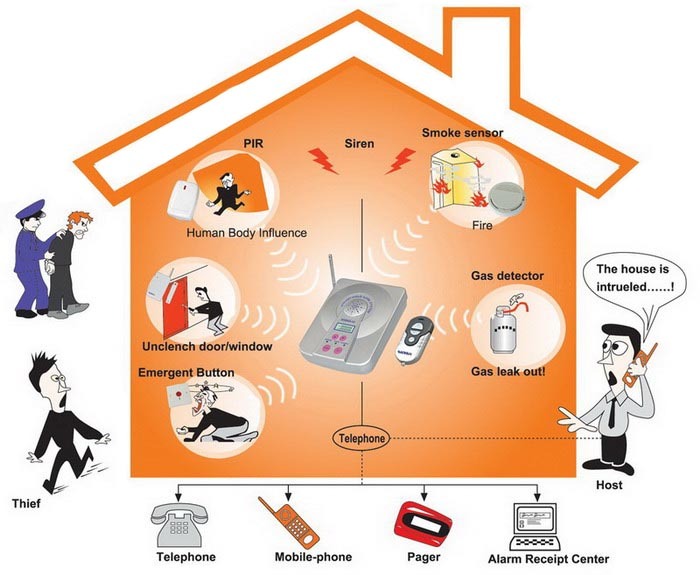 Bell Alarm System: This is nothing short of a shock to the burglar who forcibly enters the property. It triggers a loud noise enough to alert any person nearby the property and also scares the daylight out of the intruder. A safe bet to keep senior citizens completely secured at all times. If there have been incidents of robbery happening despite an alarm system being inside the house, then it must is probably the fault of the property owner who chose cheap burglar alarm systems to save money. However, if anyone has been wondering about how to keep their family members safe then they can get alarm systems installed from reliable companies such as ADT. This entry was posted on Friday, November 20th, 2015 at 7:04 am and is filed under Home Design. You can follow any responses to this entry through the RSS 2.0 feed. You can leave a response, or trackback from your own site. Why is Art rapidly going online?